Solan,May 06:Shri V.S. 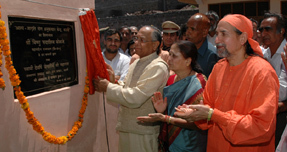 Kokje, Governor laid the foundation stone of Atma Jagriti Yog Research Centre in the campus of Udbodhan Yog Avam Ayurveda Shodh Sansthan at Kathani in district Solan today.Speaking on the occasion, Shri Kokje said that every human being should make efforts for progressing spiritually in the present materialistic world and should adopt higher values in life. He said that Adi Shankracharya, Swami Vivekananda have developed such centres of spirituality which were guiding the people and were contemporary in the present times also. Governor said that yoga and ayurveda were effective means to keep human body healthy and added that centres of spirituality were contributing towards spiritual development of individuals. He said that such centres help human beings to go through self-introspection and to develop spiritual faculty. He said that such centres would develop awakened human beings who would guide the society in future. He said that Himachal Pradesh was land of saints and people of the State were religious. Swami Dev Rishi Yog Tirath Jee Maharaj, Founder of the Sansthan delivered religious discourse on the occasion.Smt. Leena Kokje, Lady Governor was also present on the occasion.Swami Shiv Sewa Nand and Shri Dev Anand Gautam also spoke on the occasion.